As we have grown our owners have upgraded all of our equipment to the best and latest standards. We want to make sure we are up to date in our knowledge and our tools, especially the equipment placed in client homes. 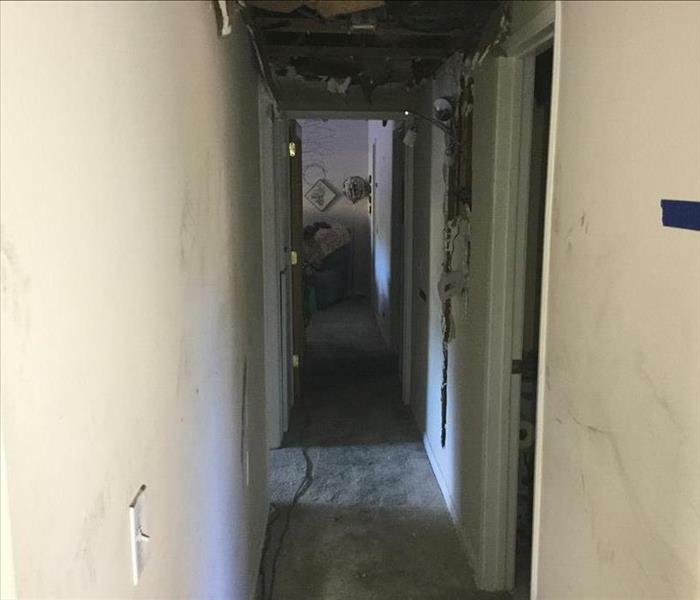 We never shy away from any water damage that may arise. Our friends at the Ross Morgan company always call us whenever any of their business properties have any water damage issues. 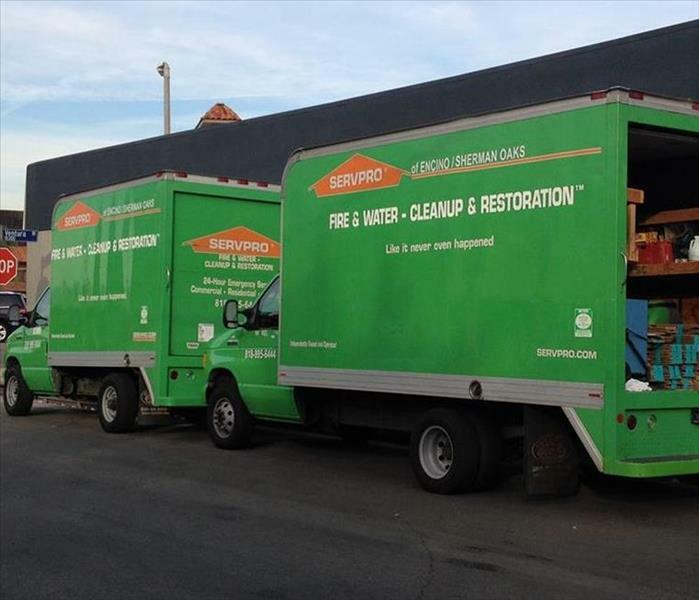 SERVPRO of Moorpark/Fillmore/Santa Paula is known for it's water remediation capabilities. All of our technicians are IICRC certified and have extensive knowledge when it comes to taking care of any size water damage. Our office staff is also trained in IICRC so they are able to understand what is happening in the field and communicate it to insure brokers/agents, property managers, and home owners. Being as large and as spread out as we are with our territories, team Reed likes to come together often and team build. 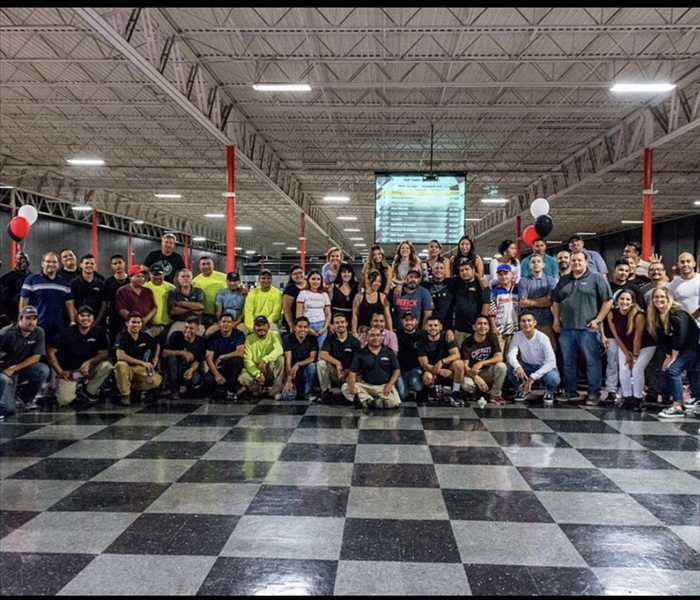 Whether its go-kart racing, basketball league nights, or fantasy football we all come together. Just like our SERVPRO Ducky, our SERVPRO Bulldog is another fan favorite. We love to give our customers, friends at the chamber of commerce, insurance agents and brokers, etc. a cute reminder that they always know who to call whenever they are dealing with a loss! 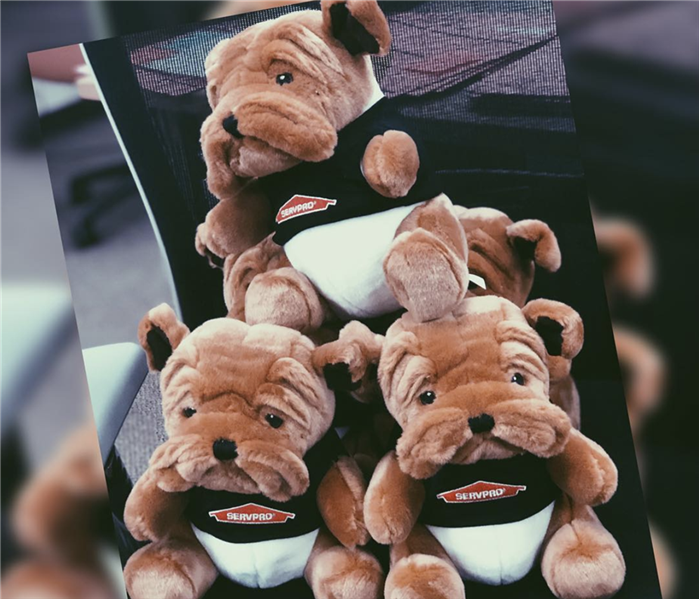 The SERVPRO of Moorpark/Fillmore/Santa Paula has an office mascot that goes with them to the job sites and is seen around the office, loved by all the coworkers, and brings a smile to even customer's face! 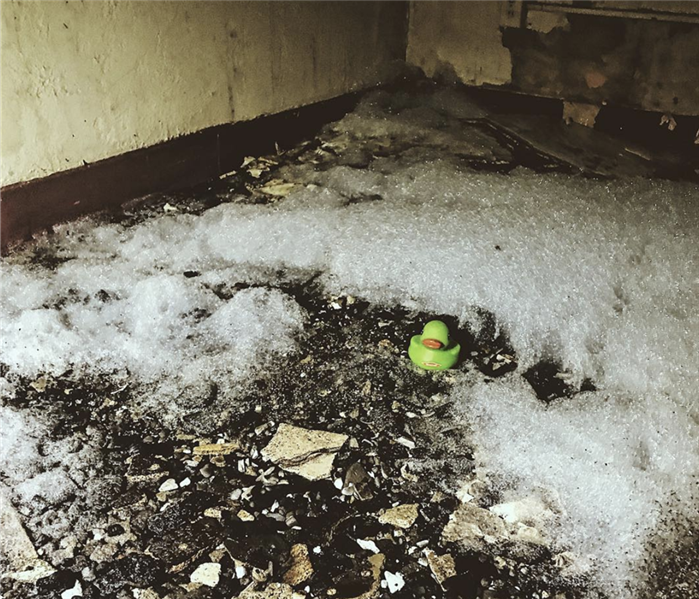 SERVPRO Ducky is there for all of your water, fire, and mold remediation needs. 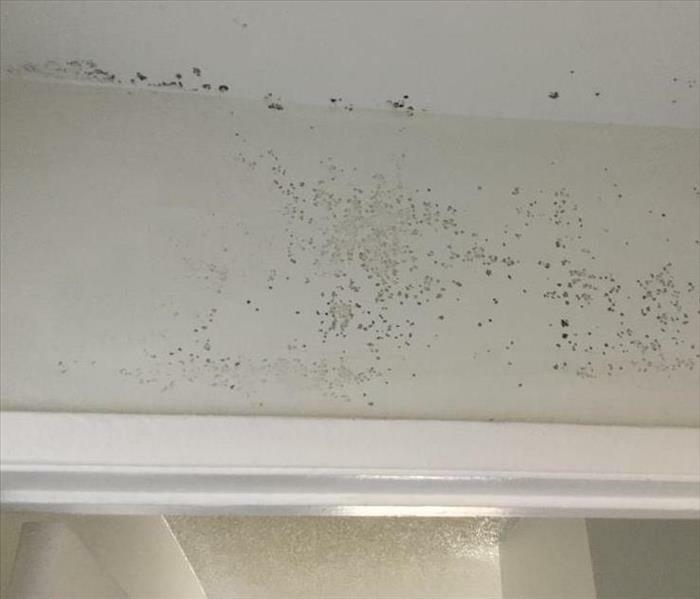 Even commercial properties can suffer from water and mold damage too! At SERVPRO we understand how imperative it is for businesses to be back up and running properly when affected by these circumstances. 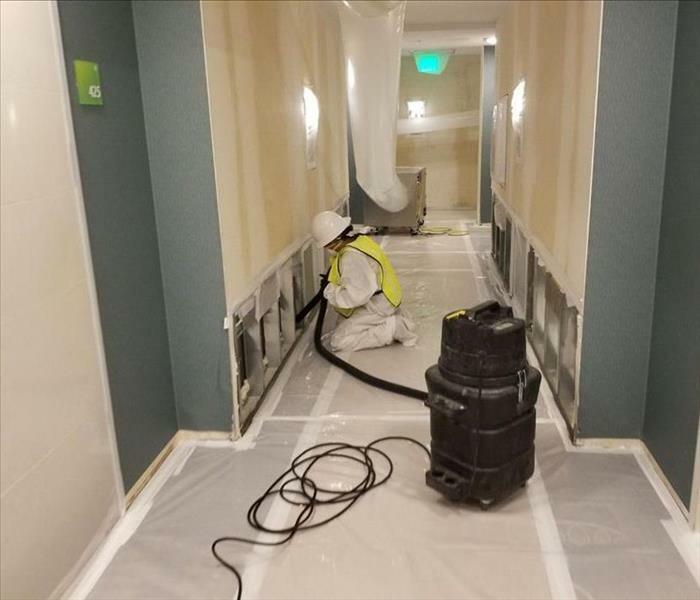 You never want to hear that the hotel you are staying in has been affected with mold, but SERVPRO has the training for all commercial jobs to make sure your business is back to normal as soon as possible. A small attic fire that started after the homeowners had too many items packed into a small space. 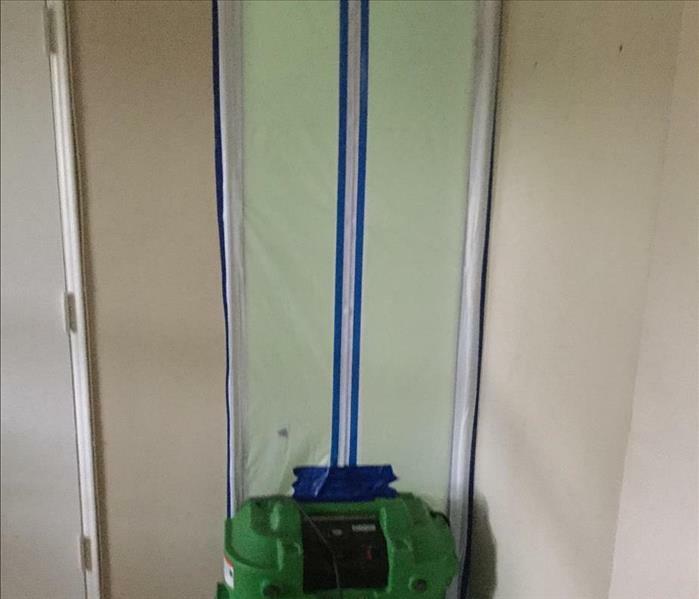 SERVPRO was able to come out and remove all the affected materials immediately to help with the air quality of the home. 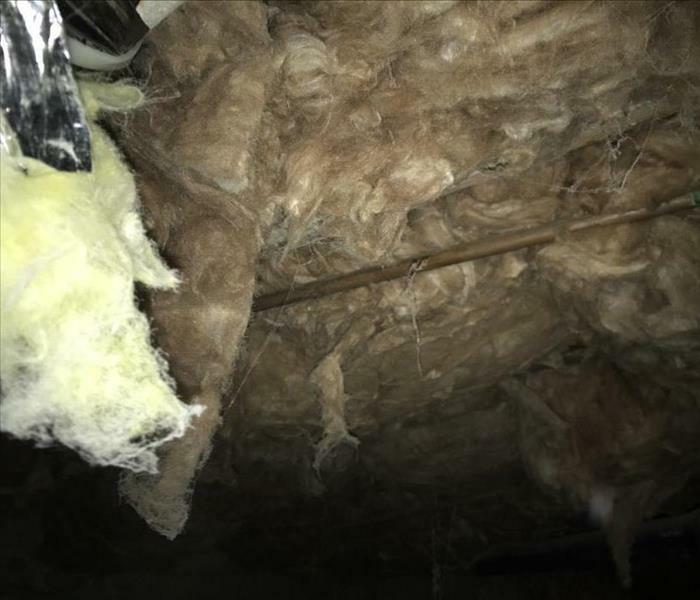 Our technicians removed over 10 bags of insulation from the attic. 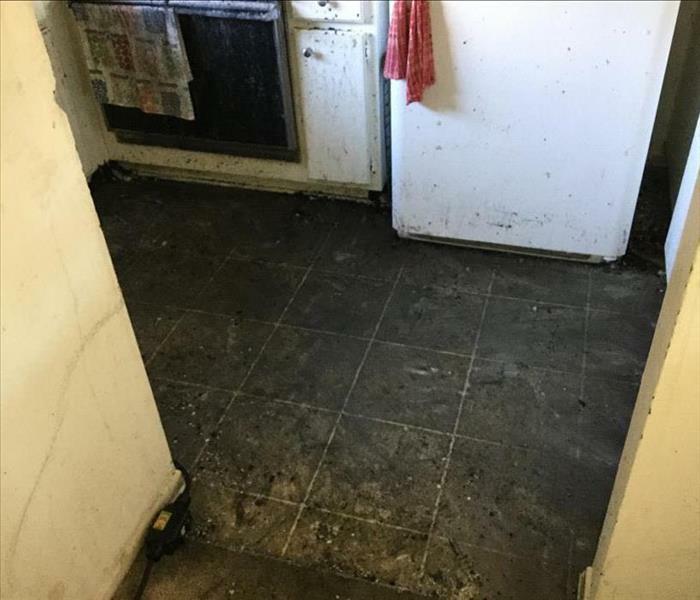 After the dishwasher supply line broke while the homeowners were gone at work, it flooded their entire kitchen and over into their living room. 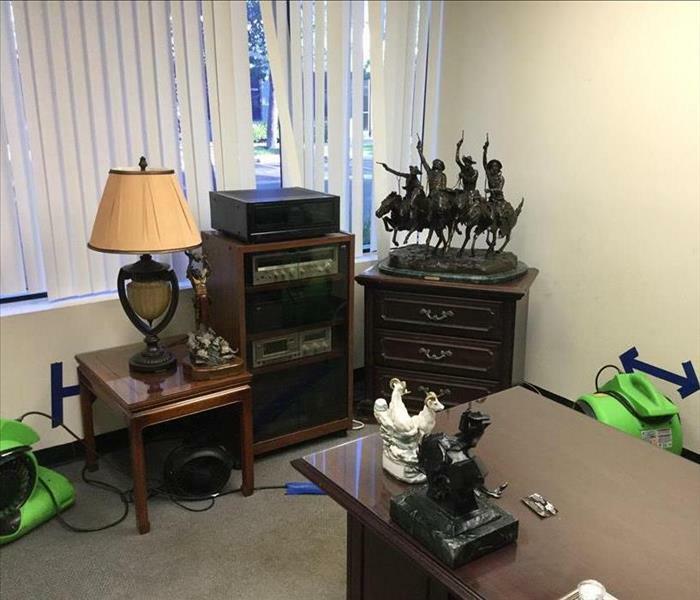 They called SERVPRO immediately and we were able to come out the same day to place equipment and start the drying process to hopefully save items that might have been damaged. 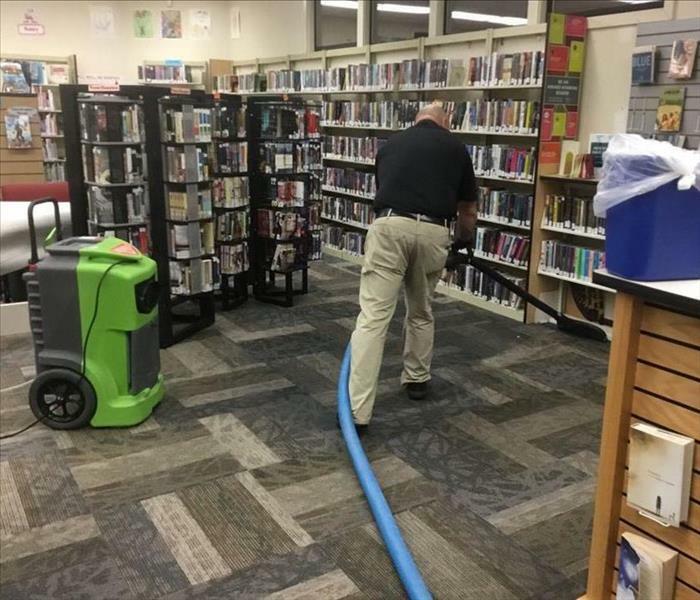 This school's library suffered a large water damage and called on SERVPRO of Moorpark/Santa Paula/Fillmore to remediate the damage. We were able to save most books and shelving units from damage and kept part of the library open for students to still use while in school for the rest of the year. Our technicians are the pride and joy of our company. Every single one of them puts forth their best foot every time they are in the field and make SERVPRO the white glove restoration company we are meant to be. You can see here they are all wearing proper PPE for the job and take the work very seriously. 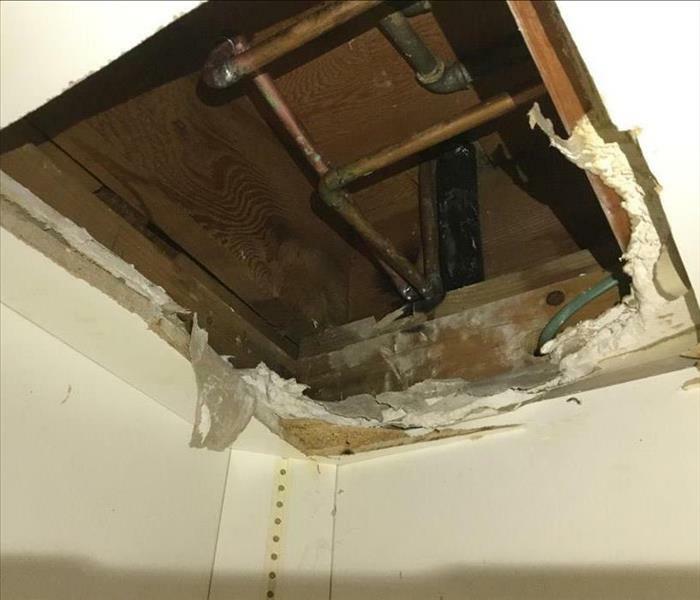 After a pipe burst in their bathroom these home owners were in need of a quick bathroom remedy. 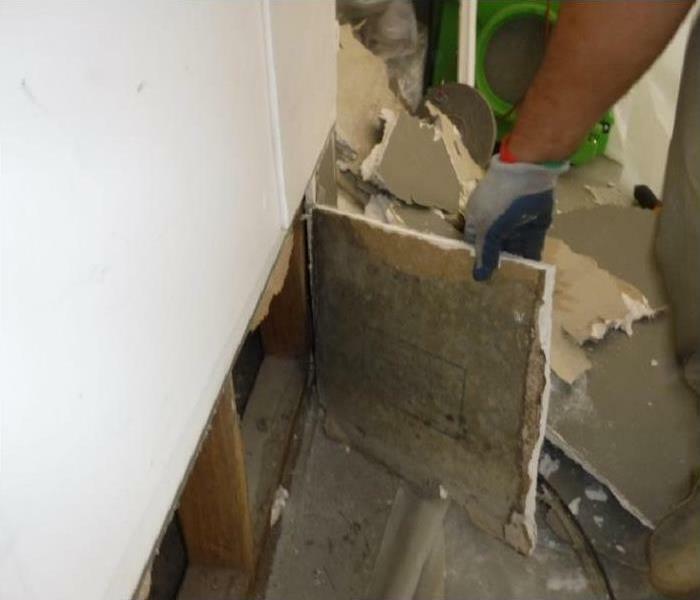 Our technicians had to remove all the water damaged materials to stop any microbial growth. 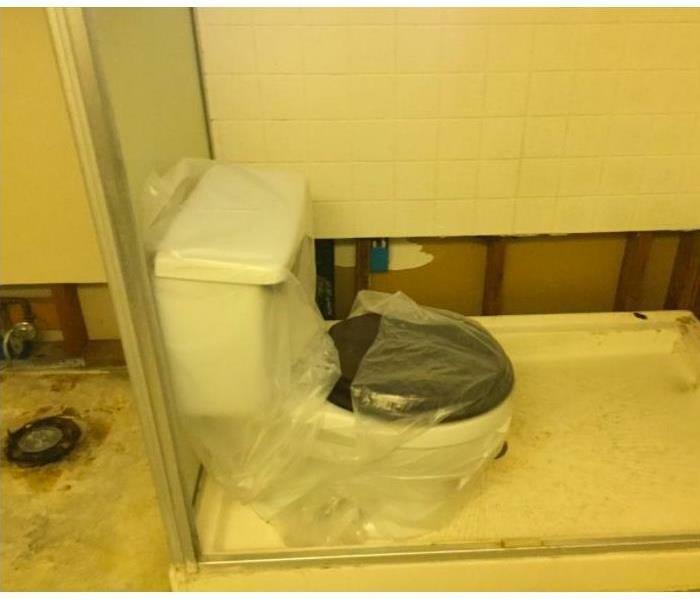 There was significant water damage near the toilet and shower as well as the main walkway, the owners couldn't believe how quickly we were able to complete the work. We make disasters "Like it never even happened." 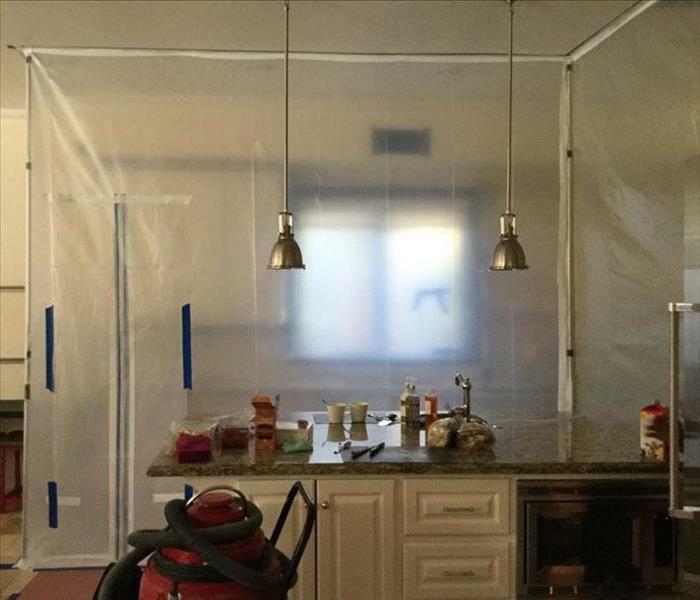 To keep microbial growth from spreading in your home our technicians create what we call "containments". Which is exactly what it sounds like, it allows the mold that is being disturbed to stay within and not contaminate other areas. This past December the Thomas Fire swept over Southern California destroying countless homes and businesses. 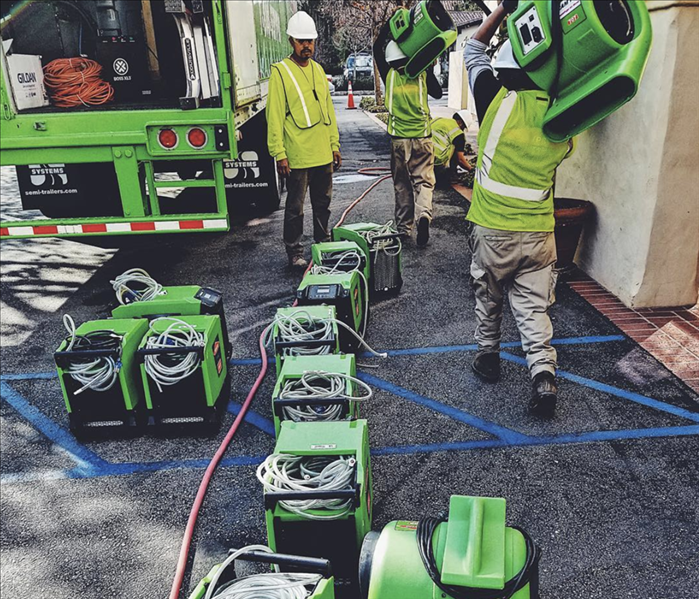 SERVPRO Moorpark/Santa Paula/Fillmore worked against the fires on multiple projects to get homes and places of work back into order. The continuously falling ash was hard to combat but our teams worked tirelessly to keep everything remediated. 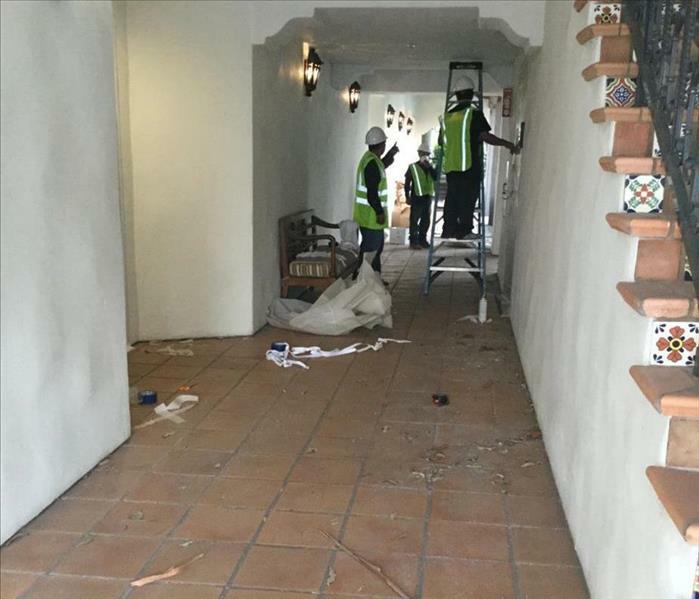 Crews unloading equipment to be placed in hundreds of rooms spanning over the Ojai Valley Inn. 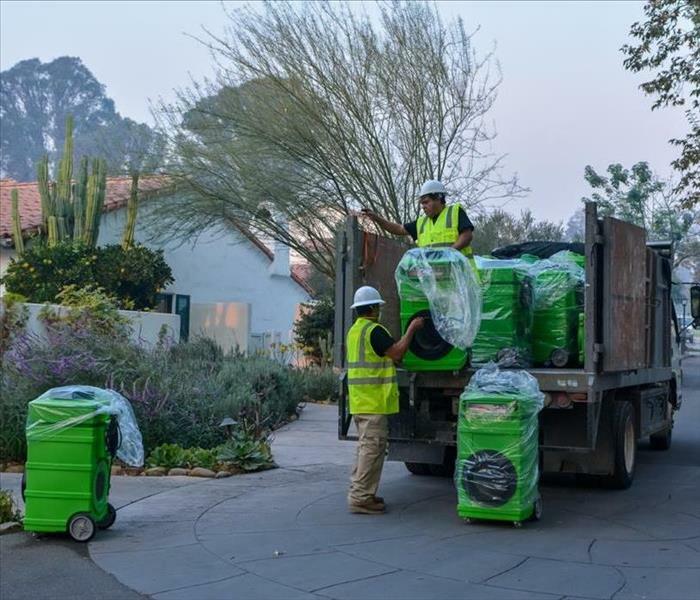 Air scrubbers are used to help regulate the air and with how bad the air quality was in Ojai it was needed through out the Inn. Filters were changed regularly to keep a constant upgrade of air until it was safe to breathe in the air without wearing a mask. Recently our crews were dispatched to a large loss that started when a cash register caught on fire inside of a restaurant. This fire affected all 19 units in this strip mall and completely destroyed the initial unit. 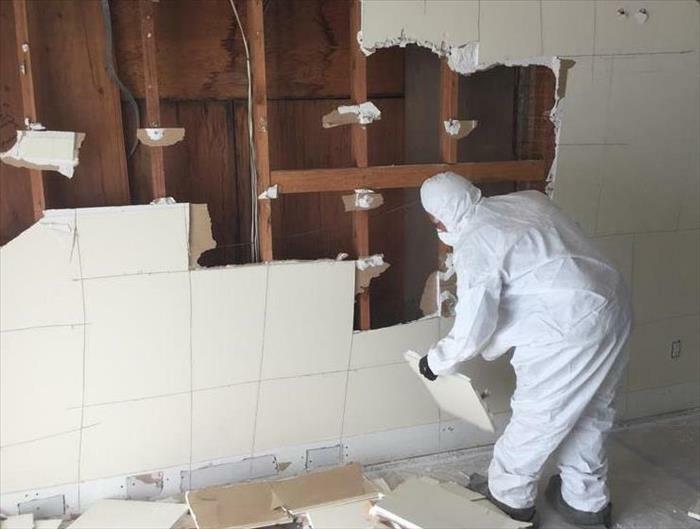 As a large loss response team our main goal is to get all businesses back into operation as quickly as we can, because we understand the urgency of being able to get back into operation. Remember to always call SERVPRO in case of any emergency. Storms nine times out of ten will always take out your roof first. If your roof and ceiling aren't ready for a storm prepare for storm damages to have some unwanted damages. 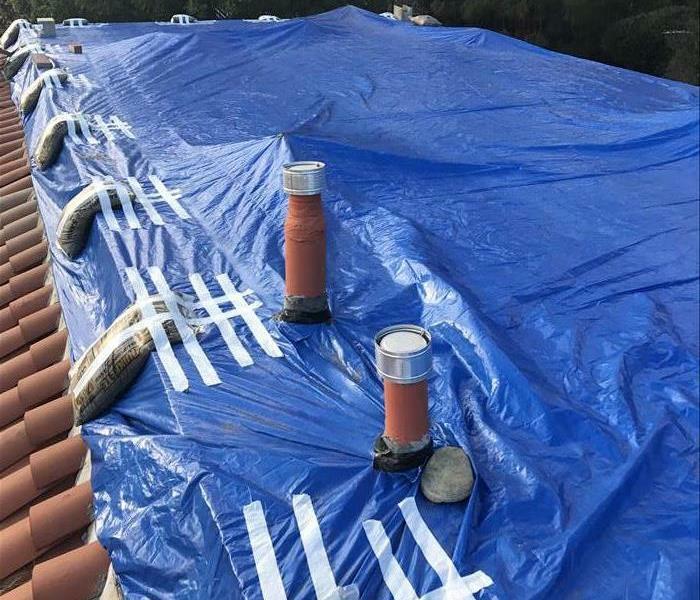 While we may not experience a lot of storm damages but when the Santa Ana winds come through it can be destructive for homeowners. Roofs are an important part of home structures, SERVPRO can be there for all your storm damages. What Even is a Crawlspace? What started as a water loss in the crawlspace turned into mold taking over the entire first floor of this home. SERVPRO was onsite to see the whole process through and make sure all mold was removed properly. Hardwood floor is hard to be salvaged after water has had it's way with it. 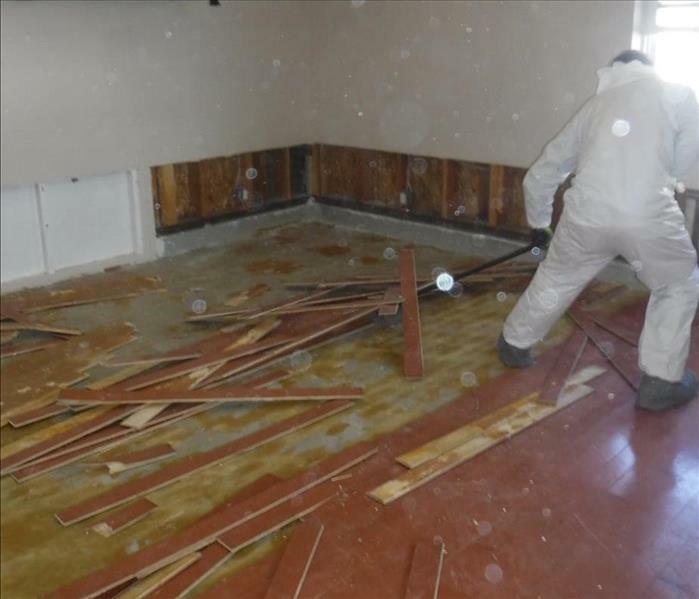 You should always call SERVPRO to help dry out your floors and get a professional flooring company out to help you with all your new flooring. 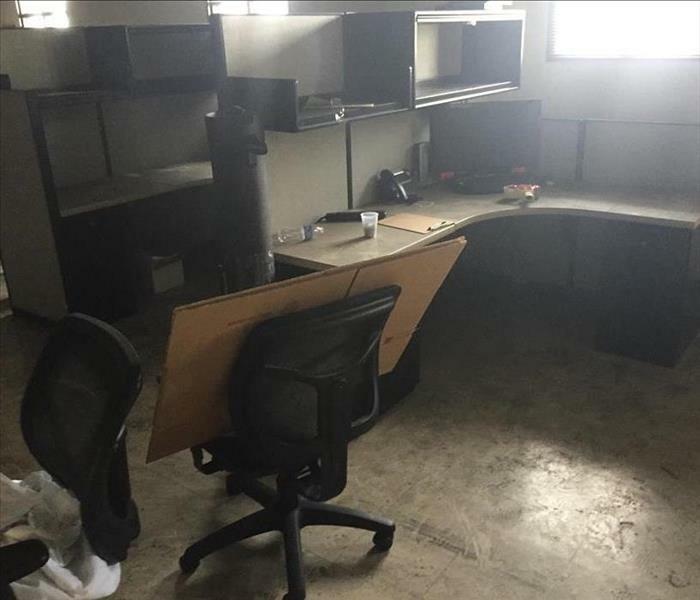 This office in Santa Paula had water damage to one of their cubicles and called SERVPRO to help with the dry out process. The carpet did have to be removed but the entire job was finished in a timely manner. Late one night this food packing warehouse went up in flames and SERVPRO was there in the middle of the night working tirelessly to help remove contents and get all important personal belongings out of the damage. The whole purpose of a fire place is to keep the fire in place. This homeowner called SERVPRO to help clean up the fire place and the surrounding walls after the flames had been put out. Our Large Loss Response Team was onsite with our green SERVPRO tent, waters, and supplies for anyone entering the building. We were able to be a point of reference for anyone on site and a great place to meet out of the sun and away from all the damage. Mold grows with a vengeance, and once it's started you must treat it quickly before it affects anything else. SERVPRO of Moorpark/Santa Paula/Fillmore is highly trained in mold remediation. We hear the words "mud slide" often but we never think it's going to happen us until it does. 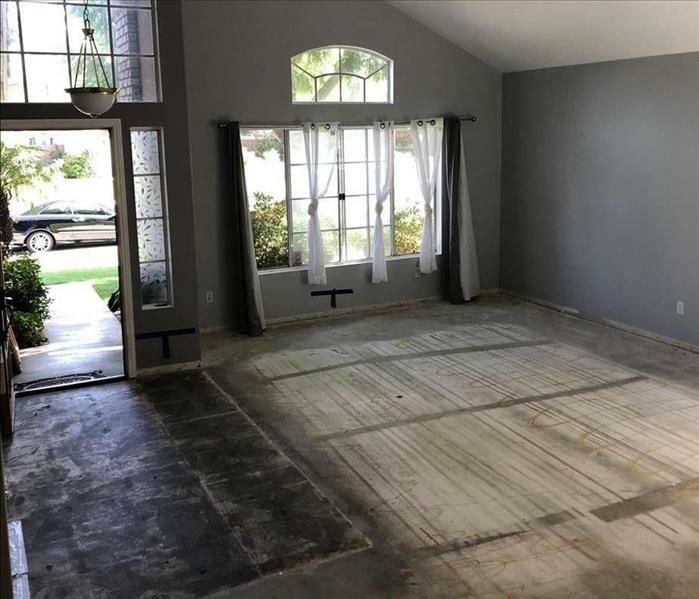 This homeowner went to work in her home office one day and discovered mud was pouring in she called SERVPRO of Moorpark/Santa Paula/Fillmore. 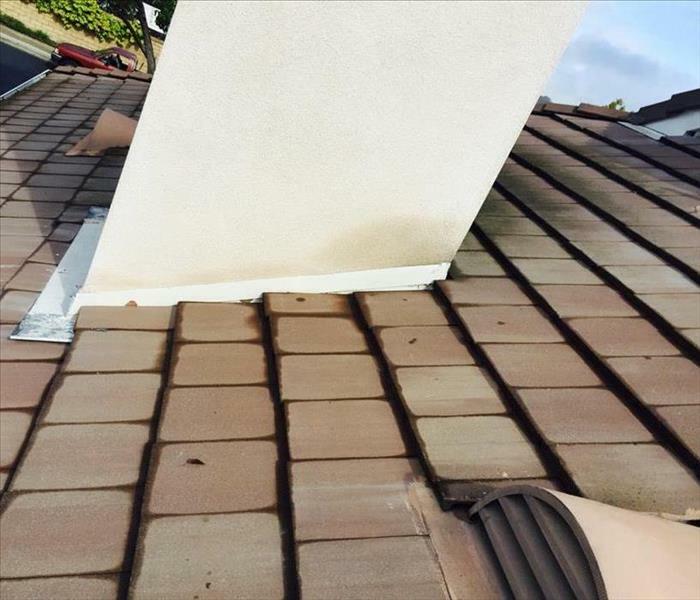 A roof leak from severe rain storms caused this roof to fall through one night a 2 AM, alarming the home owner. Needless to say it was a messy clean up. Our technicians always protect themselves from mold no matter how little or how much there is. Mold can be hazardous and at SERVPRO of Moorpark/Santa Paula/Fillmore we take all precautions. This unit owner barely noticed the little spots on his window sill until it grew to become the size of his arm. That's when he knew to call SERVPRO of Moorpark/Santa Paula/Fillmore. 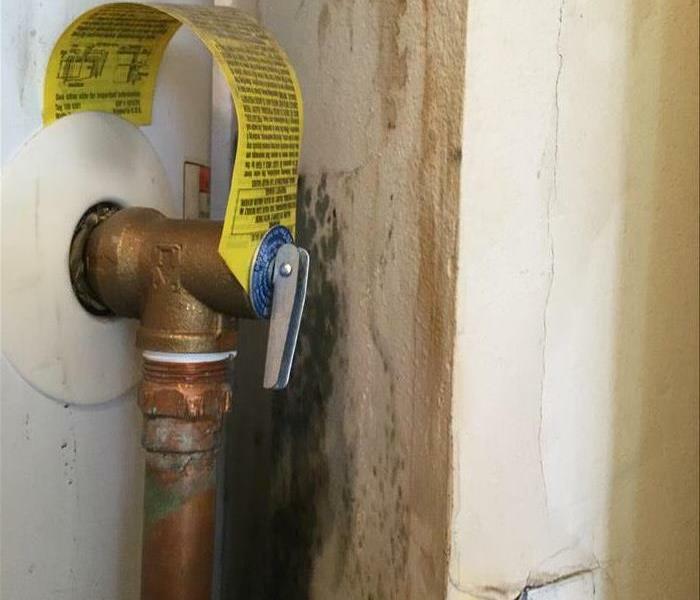 While water heaters can cause water damage don't forget if left untreated they will also cause mold growth. Which poses an even greater problem not only for your health, but in the long run. 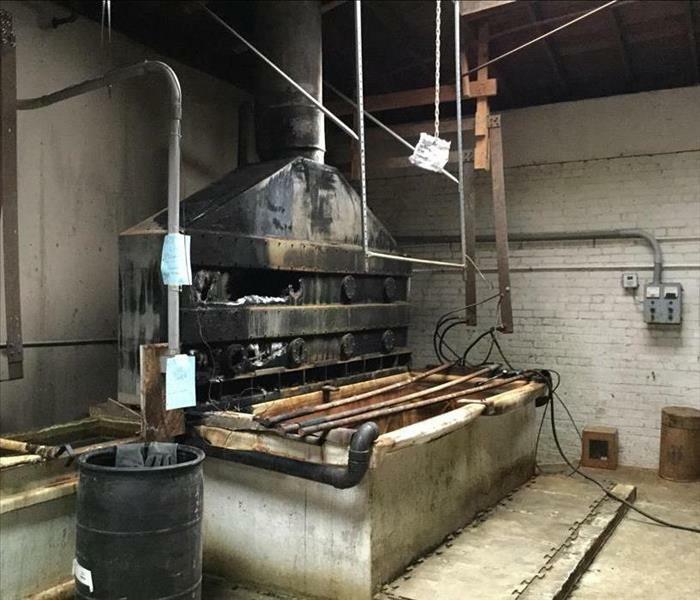 After all the smoke settled and the business owner was able to see what damage had been caused they decided to call the fire experts at SERVPRO of Moorpark/Santa Paula/Fillmore. This was the aftermath of a kitchen fire in Moorpark a few hours after the commotion had calmed down. You can see the significant soot and smoke damage. 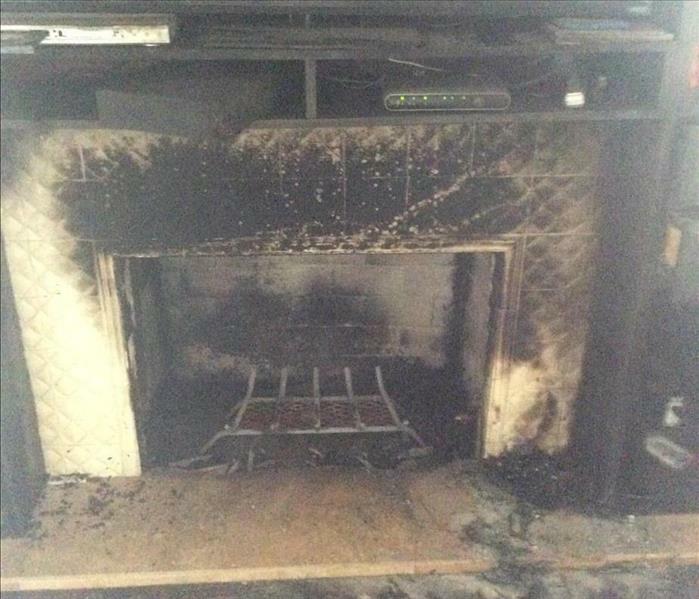 The owner couldn't believe how much damage a little stove fire could cause. 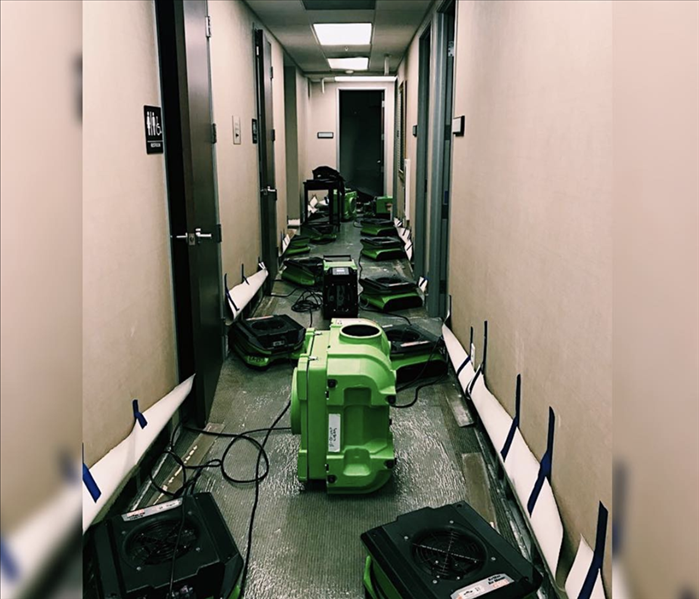 If your business ever experiences a water/fire/storm/mold damage and you're worried about finding a company large enough SERVPRO of Moorpark/Santa Paul/Fillmore is a Large Loss Response Team and is more than equipped to handle your job in a timely manner. 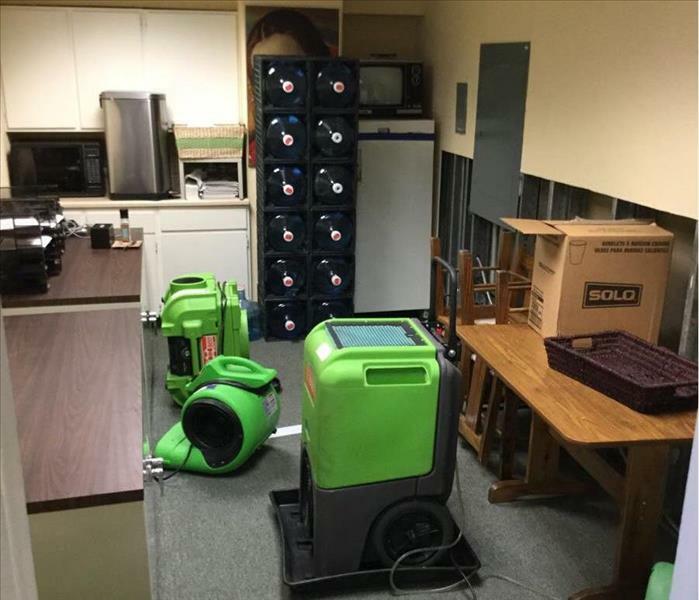 Here at SERVPRO of Moorpark/Santa Paula/Fillmore we deal with massive water losses all the time. 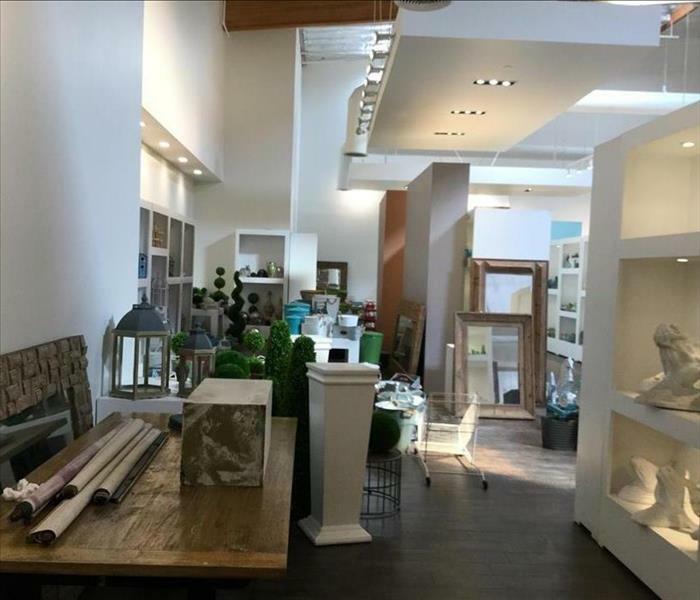 But for business owners what they see is time and money being lost, and we understand the importance of moving quickly to get a business back on it's feet. These homeowners have three young children who's health was being affected before they spotted the mold growth. Once they caught it, the mold had spread from the bathroom into the bedrooms. 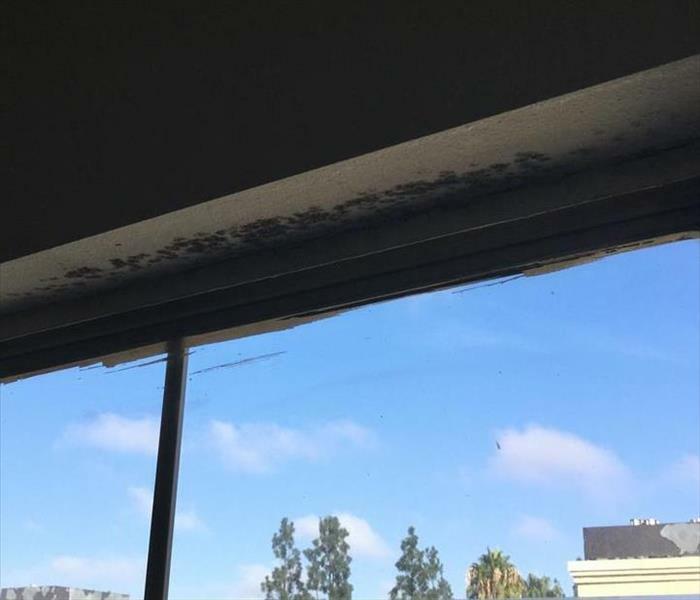 Thankfully SERVPRO Encino/Sherman Oaks was able to re-mediate all the mold and get the family back to a normal living pace. Rain is rare in SoCal but so is mud in your home! Here you can see this homeowners closet is caked in mud from the rain that crept into his home. Oaknoll HOA and SERVPRO Thousand Oaks called out SERVPRO of Moorpark/Santa Paula/Fillmore to help with a huge fire loss that included 10 affected units. The residents and the HOA were thankful for the quick response time and work done to get them back into their condos. As a Large Loss Destination we are able to get to clients in other territories when jobs are on a larger scale. 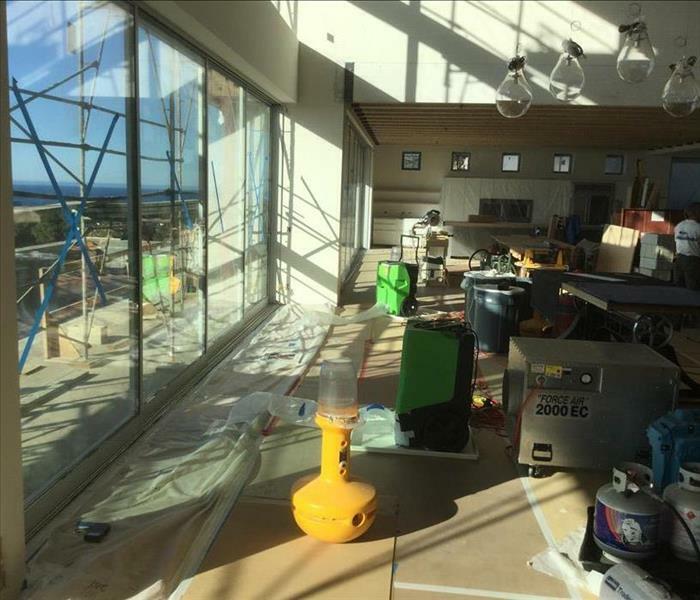 This is a retail store that we were on site for and were able to help out a neighboring SERVPRO. The washer that packed up against the shared wall to the kitchen overflowed and caused for a full kitchen demo. 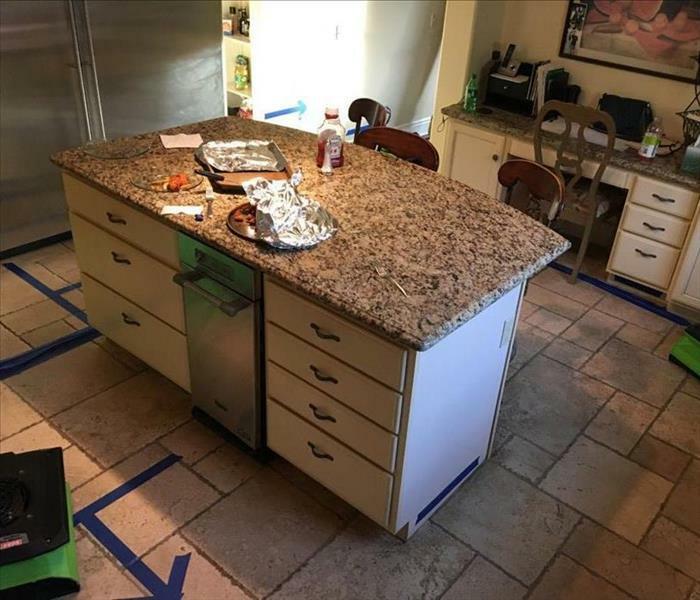 Our technicians were able to move quickly to get the homeowners back into their beautiful kitchen. Recently, we have been able to help the Moorpark USD on multiple occasions. 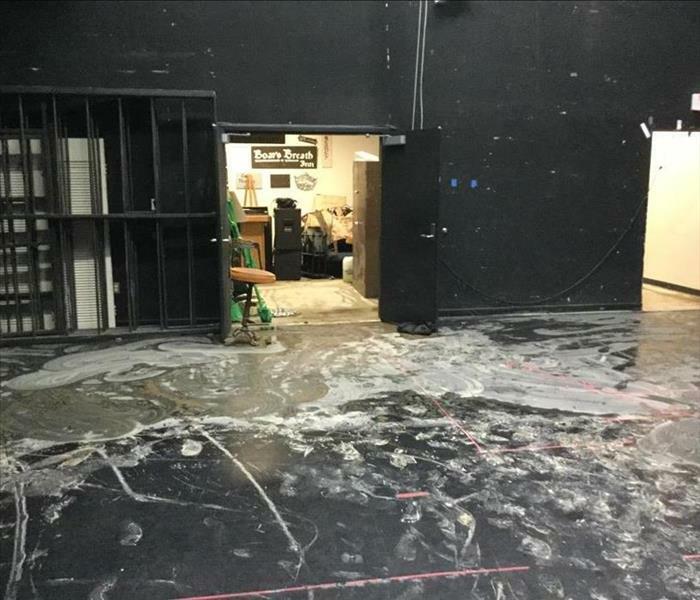 This was a water damage to their precious auditorium they needed soon for an upcoming spring recital. 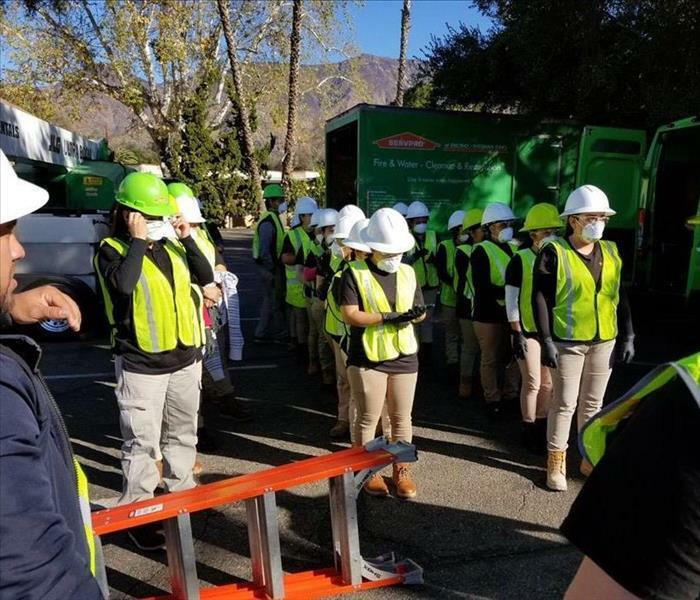 Recently SERVPRO of Moorpark/Santa Paula/Fillmore was able to come to the aid of a condominium complex that was hit hard by a fire. After an extensive few months the condo residents are getting back to normal life. 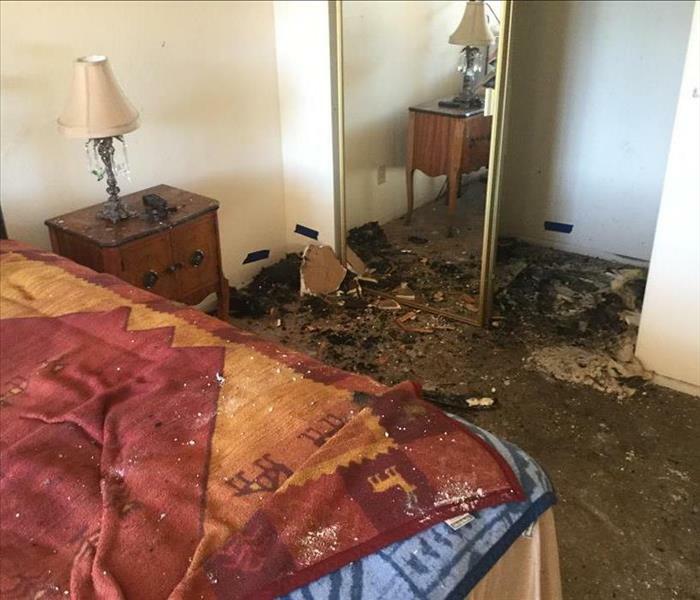 This was the aftermath of a burst pipe in Thousand Oaks home that affected four separate rooms in the home. All of the flooring had to come up and the baseboards removed but we were able to act quickly before mold was a possible contestant. 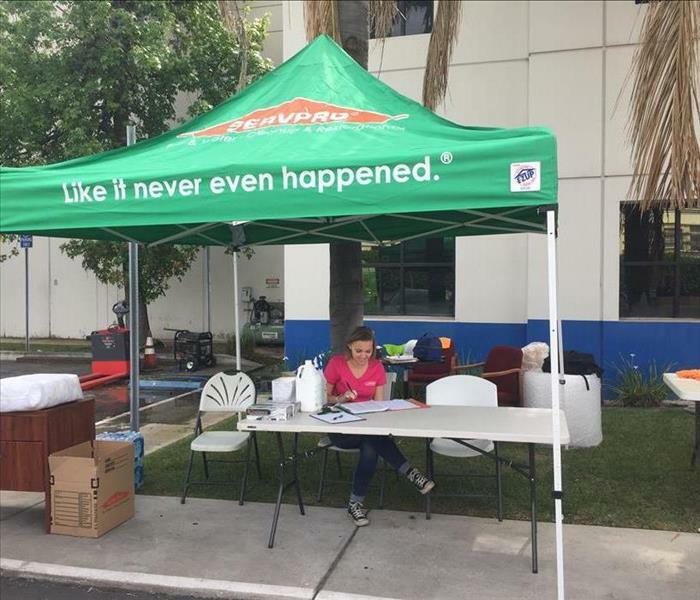 SERVPRO is your storm emergency destination, when the rains hit hard in Southern California floods of calls came in about roofs leaking. Once the rain was able to calm down a little bit we were able to get crews out to fix the problem temporarily for customers. This beautiful country club suffered from the brush fires that hit Southern California this year. SERVPRO of Moorpark/Santa Paula/Fillmore was able to be a helping hand in the fire restoration to get the outside and inside looking brand new. 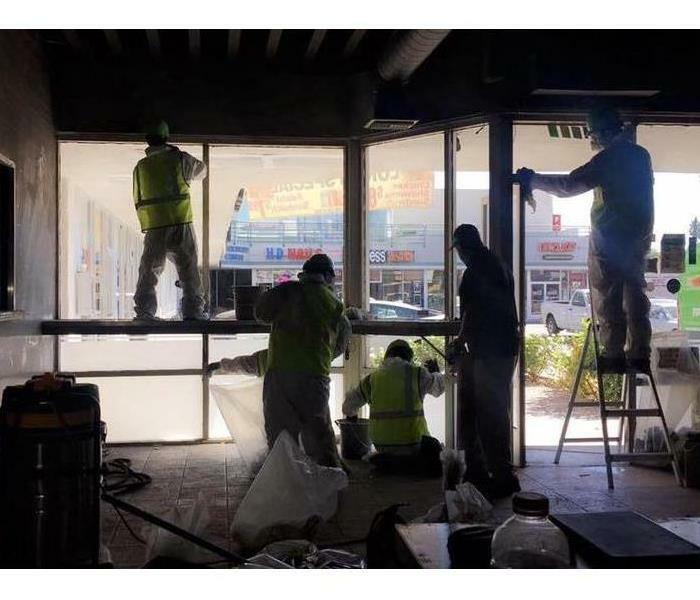 This commercial building suffered a huge loss from a broken pipe that burst in the middle of the night and no one was able to attend to it until the next morning. Sometimes our crews have to mitigate hard to reach areas, but they can't do it alone. It is always best to take the highest level of safety precautions when operating large equipment. Every few months our SERVPRO franchise is given the opportunity to host Continuing Education Courses. Courses can include: Biohazard Cleanup, Restorative Drying for Water Damage, Fire Damage Restoration, etc. 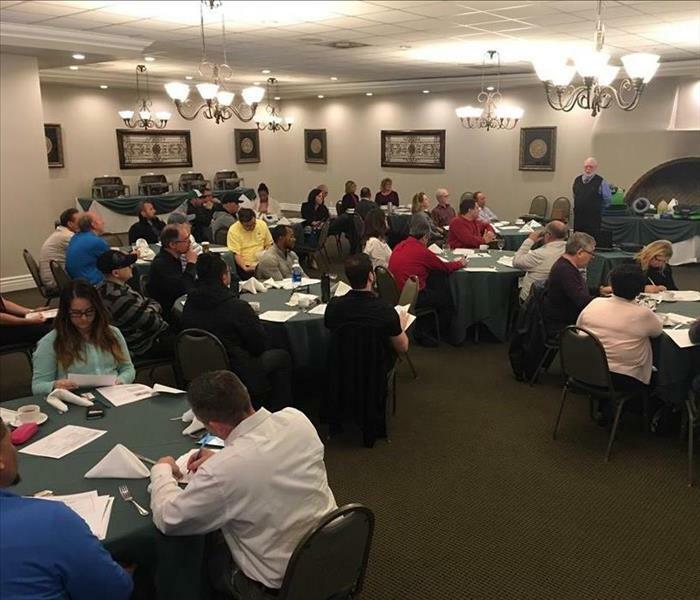 Our courses are always exciting and include lunch, golf, or gift cards for those in attendance. Wet carpets in your home are never fun. Our technicians use special tools called moisture meters which allows them to get accurate readings. It works on carpets, wood floors, concrete, walls, etc. While it might not be the prettiest house decoration, containment is necessary. 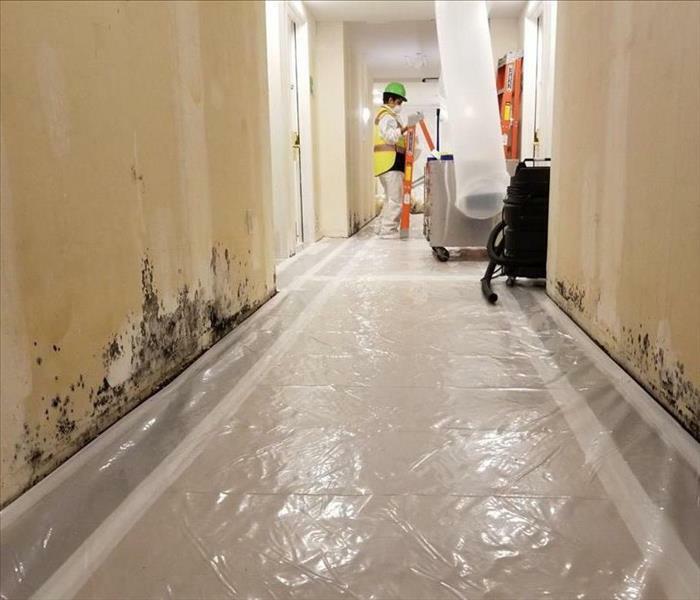 It prevents any microbial growth from spreading, or when the technicians perform demolition it stops debris from travelling through your home. But don't worry we promise it will come down when the job is done. New SERVPRO Vans to get us to any disaster faster. The new vans will allow us to hold more equipment as we all supplies used on the job. Look out for those orange and green vans!